“The companies that succeed will be those that take the time to gain an understanding of the needs of each of the parties involved and then design an infrastructure that provides a win:win:win solution for all,” according to our new ‘NFC Business Models’ research report, which officially launches today. RESEARCH: The new 170-page NFC Business Models report is available for delivery today. NFC Business Models is a new research report written by Sarah Clark, editor of NFC World, that sets out the tasks involved in creating a commercially successful NFC service and provides readers with the latest thinking in terms of both the strategies available and the most likely routes to success. The new report gives detailed guidance on the lessons learned to date, the questions that need to be addressed as you formulate your plans and the options available for mobile network operators, handset manufacturers, financial institutions, industry suppliers and others looking to build new revenues from the provision of NFC services. 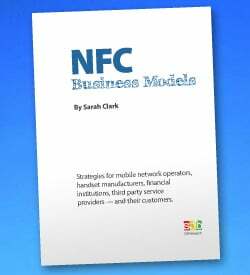 NFC Business Models is published by SJB Research and is available for delivery today. Buyers get a PDF copy by email immediately, with a printed copy following by airmail. More details — as well as a complete table of contents and online ordering facilities — are available at www.sjb.co.uk/models.